Earth Angel - Beauty Snoop - Skincare mogul and street-style star Miranda Kerr's guide to looking gorgeous. Like spring's mod black-and-white stripes, Miranda Kerr is suddenly everywhere: on camera, critiquing sartorial creations as a guest judge on Project Runway All Stars; in the office, dreaming up new potions for her Kora Organics skincare line; on the catwalk, sporting a diamond-encrusted bra at the Victoria's Secret Fashion Show; on the streets, rocking killer off-duty looks with husband Orlando Bloom and son Flynn. Next up, she follows the likes of Kate Moss and Scarlett Johansson as the new face of Spanish mega-chain Mango. "I love the brand -- they have such great taste and style," says the Aussie beauty. We feel the same about Kerr. Thousands of beauty products were launched last year, joining the tens of thousands of jars, bottles, and tubes already on the shelves. Overwhelmed? Don't be. These...are all you need to know -- and own. 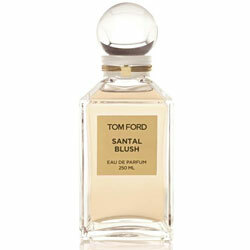 With creamy sandalwood and cinnamon, Tom Ford Santal Blush has a luscious spiced-rum quality. The most successful fall fragrances don't express a change in climate, but a shift in light. This is very unassuming for a spicy oriental. The exaggerated sandalwood accord is supple and creamy, like velvet. There's an understated sexiness and a lingering buttery warmth.